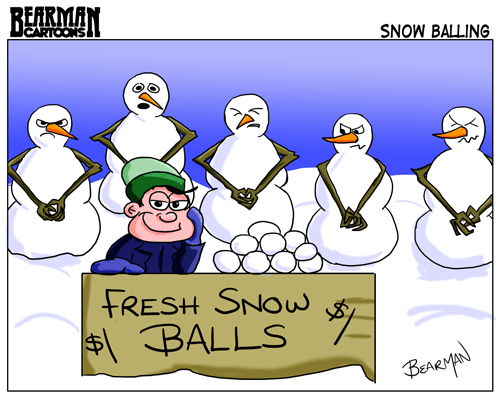 And here you thought snow balls came from the ground. Oh no my friends. The fresh ones come right off the vine…er snowman. I have a feeling others have done this joke before me only cuz it seemed so obvious. I am sure my astute readers will point it out. Yikes! At least they still get to keep their carrots. Now, I’m gonna spend the rest of the day limping. Curses! Brings you back to your wedding day when your wife snatched your balls and now is in charge of them. I sure would like to see ’em again though. I wonder if they’ve grown up any. I don’t know…what is the saying about brass monkeys. Oh for crying out loud Tony….. where have your friggin %%^&&^&%^ blogs gone??? which of the many loon? I like this one, Bearman, I think it’s original. And that’s the nice way of saying it. I tried to convey the knowing smirk on his face. Glad it went over well. Yikes! I hesitate to imagine what is happening in a blizzard! Bwahahahahahahaha, When I saw the post title I was already there. Good one. It’s amazing how they write themselves. 2 balls for a dollar! Well, I am assuming they are bought in pairs. Why do men always clutch this area of their body every time someone mentions something happening to their balls? Mention a vasectomy & every man in the room clutches his balls & groans. Did you know when a dog hangs around a snowman his balls turn yellow (the snowman not the dog). Oh one more stupid thought – you don’t want to know where the slushy comes from. Revenge of the snowmen may keep him from smiling too long. Recently married snowmen, no doubt! [smirk] Have a very Merry one! Jingle those balls men, they are loaners now! Jingle ALL THE WAY home. Now I can’t shake the terrifying notion I’ve been throwing gonads all these years! It’s the first time for me seeing it, but it does seem like an obvious joke. You may be a genius bearman. The look on the salesman face doesn’t take away the pain of the snowmen. For some reason the first thing that popped into my head was that it was a Calvin and Hobbes joke but Bill would never have gotten that printed. How about some frozen peas. That is what my friend who got a vasectomy used. If ice doesn’t work, heat usually does. Dang, now you have me wondering about snow cones and wandering herds of snow heifers. That guy should be careful… neutered snowmen could be dangerous! Now I am picturing all the snow men in my neighbor hood as eunuchs. Is that where snow cones get there snow balls? I originally was going to have him selling snow cones but snow cone balls didn’t work. And very few customers I suspect. And they are cheap, no less. Brill. Happy Christmas, Bearman. I’m so slack Bearman. I have been meaning to send you a little Aussie food package. Will do after the festive season. Have you tasted vegemite yet???? You trying to POISON me?? Yes….gelled motor oil is what that is. I live the second snowman who looks like he’s in denial. It’s a safe place to be. May your balls never turn blue (whether from cold or any other reason!) and your talent and humor keep us me laughing and amazed in 2014. Don’t think that’s a stretch -grin-. Hugs to you and your family my kind friend. Now I want even less to be pegged in the face by a snowball. That’s really saying something, since I’ve never particularly wanted that.